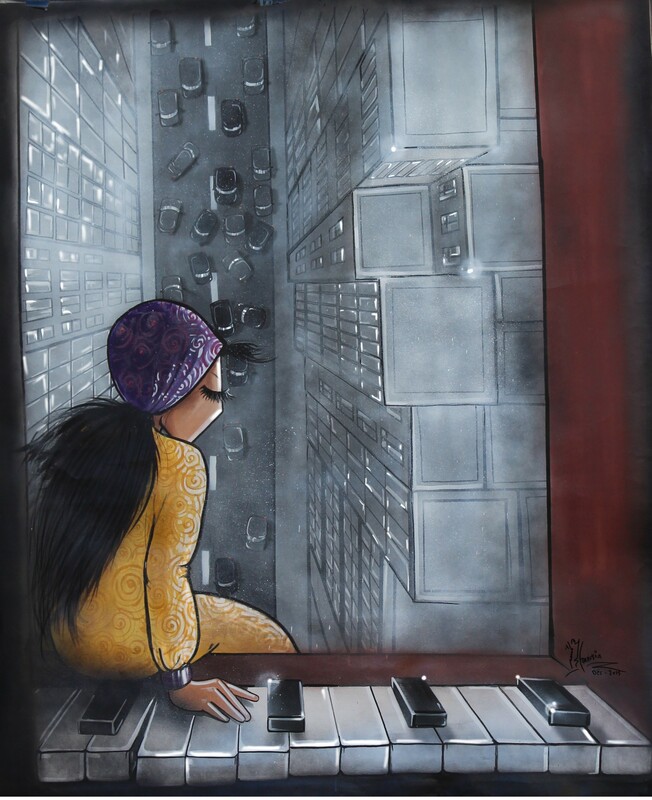 Shamsia Hassani, one of Afghanistan’s first female street artists, makes vibrant murals and paintings depicting women as strong, independent figures. With bold lines and sharp angles and sealed lips or no visible mouths, her women often carry and/or play musical instruments, which provide them with a voice, a vehicle for self-expression. In the series Secret, the women wear the burqa, which Westerners often assume is a form of oppression, but in Hassani’s work, the transparent fabric reveals the strength and humanity of the woman beneath, despite her covering. She’s attempting to point out that choosing to wear the burqa or hijab is not the issue; women will not truly be free until they can speak for themselves, and be heard. Hassani aims to destigmatize the misperceptions of Muslim women by illustrating that removing the headscarf is not the same as liberating women. In another series, Birds of No Nation, the women are depicted observing cities from rooftops. They have come to a new city in search of refuge from the chaos of their homeland, much in the same way that birds migrate in search of food and safety. Yet, these women living in a foreign land are constantly on the outside looking in. 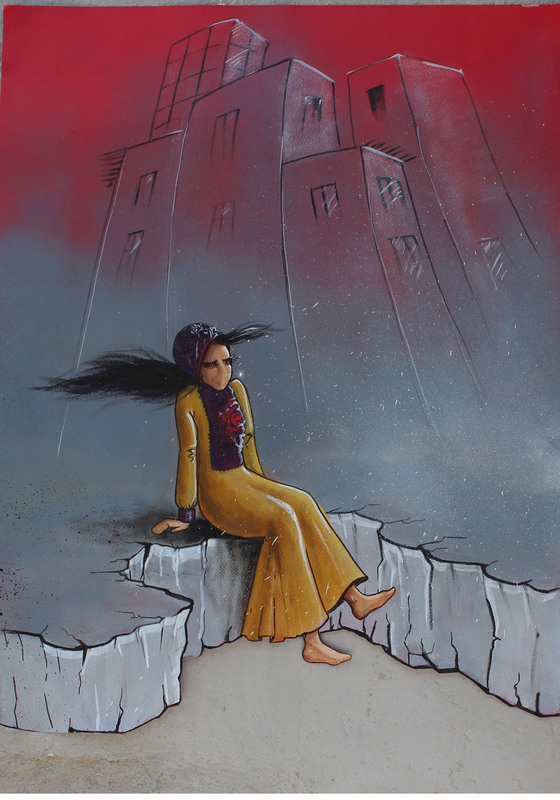 This series speaks to the mass migration of Afghan citizens to neighboring countries, which Hassani witnesses daily, as well as her own itinerant history (she spent the bulk of her childhood in Tehran, Iran yet remained an Afghan citizen and thus didn’t have the same rights as Iranian nationals). During her residency at the Hammer Museum, Hassani met with local artists (including street artists such as Kenny Scharf), she painted a mural at 4900 W. Adams Blvd, and she exhibited her paintings at the Seyhoun Gallery in West Hollywood. 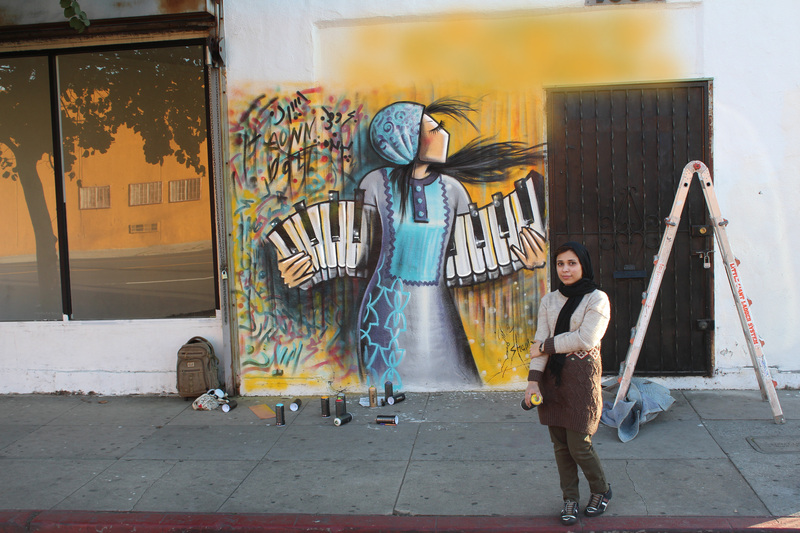 As a member of the fine arts faculty at Kabul University, Hassani was also interested in learning about American MFA programs and the curricula so she met with faculty and students at UCLA, Otis, and UC Irvine. Her story has been an inspiration for many and during her time in L.A. she formed a deep connection with the Hammer and its community, which will no doubt continue to grow and develop. 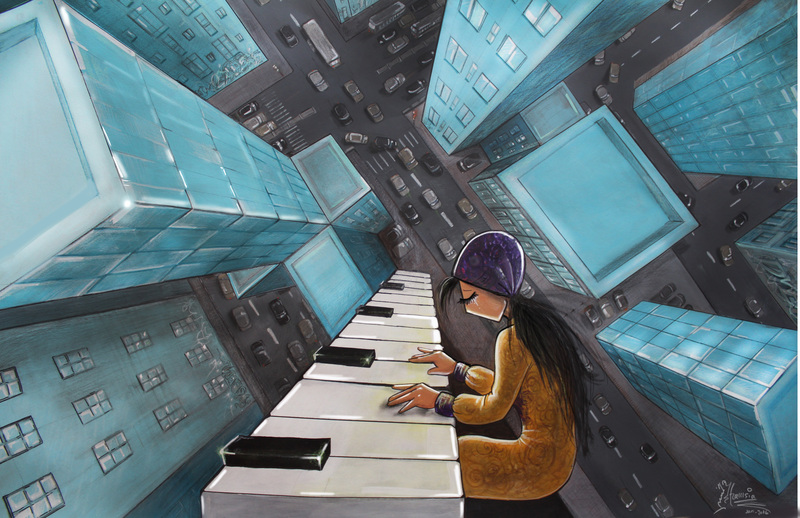 Shamsia Hassani (b. 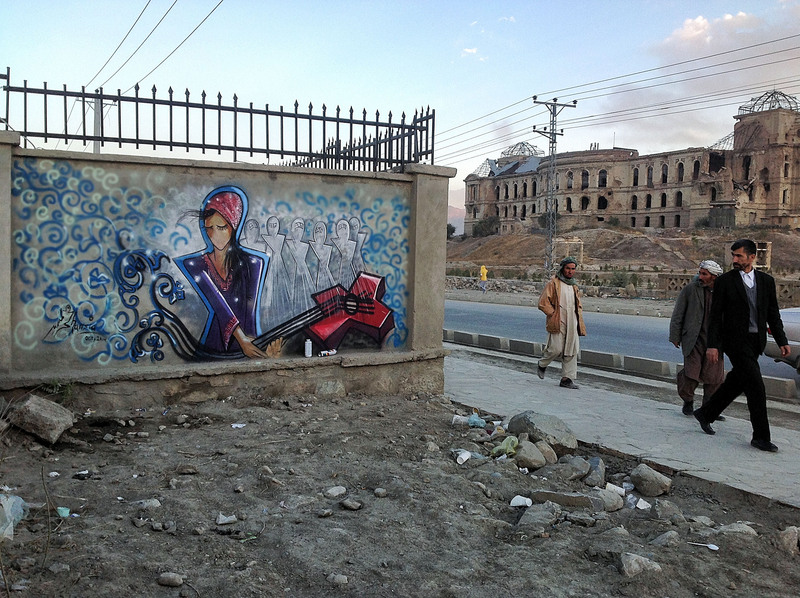 1988, Tehran, Iran) is a graffiti artist and a lecturer of Fine Arts at Kabul University, Afghanistan. She received her bachelor’s degree in Arts in 2010 and master’s degree in Visual Arts in 2014 from Kabul University. 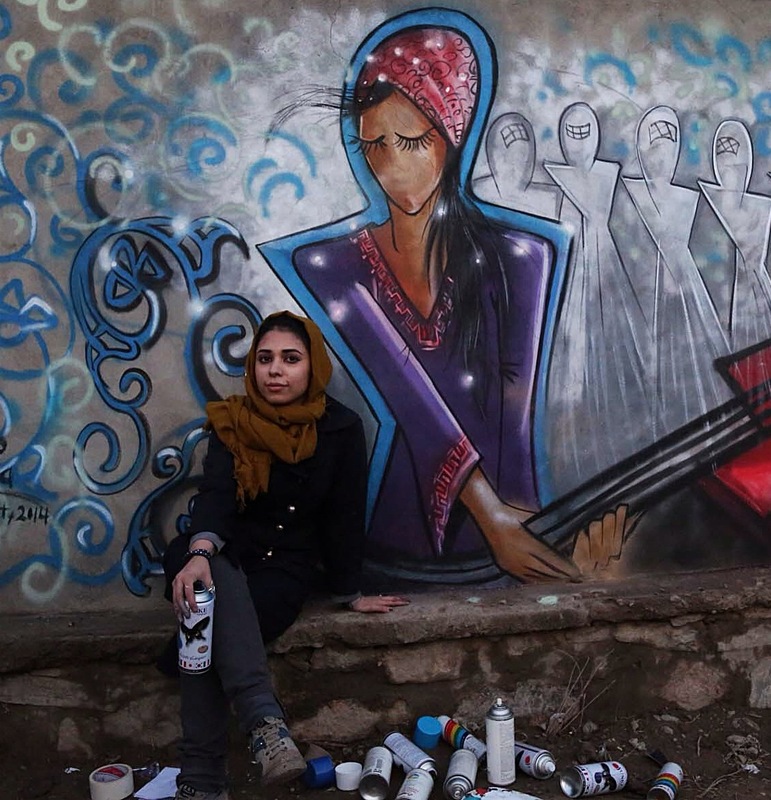 She is a co-founder of Berang Art Organization, an artist-run group that promotes contemporary art and culture in Afghanistan through programs, workshops, seminars, and exhibitions. Her work has been shown in Afghanistan, Australia, Denmark, Germany, Iran, India, Norway, Switzerland, and Vietnam, where she has also participated in conferences and workshops. The Hammer Museum's Artist Residency Program is supported by The Kayne Family Foundation and Susan Bay Nimoy and Leonard Nimoy.